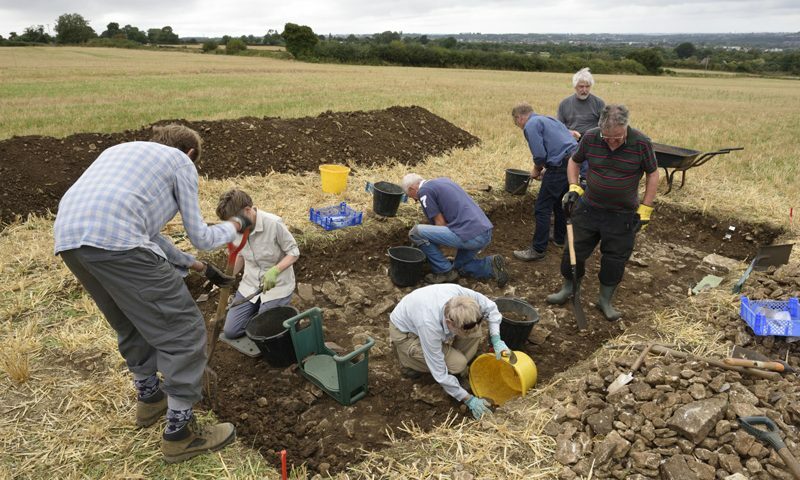 BACAS, together with the Saltford Environment Group, continued the search for a Roman farmhouse or villa 13-14 August, 2018. This dig was originally scheduled to start in the first week of October. However, the heat wave and drought led to the farmer changing his plans for the field and the dig had to be rescheduled. In 2015 and 2016, BACAS, supported by SEG, carried out geophysics surveys for a significant section of a field in Saltford where a Roman coffin complete with the skeleton of a young man was found in 1948. In addition to the possible presence of some prehistoric roundhouses, signs of what may be a Roman structure were discovered. Robin Holley (BACAS Director of Archaeology) supervised the opening of trenches in places determined by the geophysics. We didn’t find a wall but we did find what appeared to be a (stony and uneven) pavement of some sort extending over the whole of the trench area. We found numerous bones, some of them butchered, lots of small hobnails and fragments of pot (none of them particularly large). Also, three Roman coins which we are going to get identified and dated (probably late Roman). On the final day we dug down below the pavement and found what was clearly the bedrock. This was around 2-3 ft down from the surface of the field, which ties in with previous reports for the site. Further investigations are being considered.